Ohio’s top high school stars took the court this past weekend as part of an annual four-day hoops festival known as Flyin’ to the Hoop. The event, ranked the #2 showcase during the high school season, took place at its usual Trent Arena at Kettering Fairmont HS, in front of sold out crowds on Saturday and Sunday. With college coaches from schools like Kentucky, Michigan State, Ohio State, West Virginia, Oklahoma State, Cincinnati, Dayton and many more, the atmosphere was high level as several games went down to the wire. 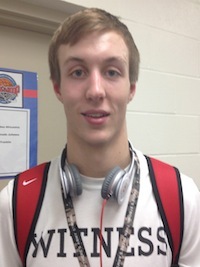 Luke Kennard – ’15 Franklin SG: Kennard came into the contest averaging just north of 40 PPG, and did not want to disappoint the crowds as Franklin played their biggest game of the regular season. The 6’5 offensive star took over the game on Saturday night against Houston’s HCYA, and their star Justin Jackson (North Carolina signee), as Kennard poured in 38 points in a narrow Franklin loss. Kennard knocked down some perimeter shots, although it wasn’t his best shooting night, and was more effective slashing to his left hand and scoring with crafty finishes. An aggressive scorer on a team that needs him to do it all offensively, Kennard’s grit and shot-making ability were on full display Saturday. The top-20 nationally ranked junior recently cut his list to seven schools – Kentucky, Louisville, Duke, North Carolina, Ohio State, Florida and Michigan – and is planning on making a final decision sometime shortly after the high school season. 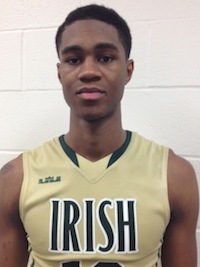 VJ King – ’16 Akron SVSM SG: No player in Ohio has received more hype in their high school career than King. At Flyin’ to the Hoop, no Ohio player did more to deserve their hype, except possibly Kennard, than King. The 6’7 slender wing put on a show offensively on Sunday as his team defeated Normal (IL) University school and their star Keita Bates-Diop (Ohio State signee), as King tallied a total of 30 points. King has a such a smooth game for a sophomore, as he put his whole offensive package on display as a slasher, shooter, passer and overall scorer on Sunday. One of the top ten sophomore prospects in the nation, King’s offensive abilities seem to show no limit, one of the reasons that he is being recruited by some of the best schools in the country. Esa Ahmad – ’15 Cleveland Shaker Heights PF: Another one of the top stars in an impressive 2015 class in Ohio, Ahmad is one of the most dangerous scorers in the class with his offensive versatility and aggression. A skilled and powerful big man that stands just over 6’7, Ahmad had another monster outing as he scored 28 points in a win over Saint Louis Christian Brothers and their star Jordan Barnett (Texas signee). Showing off his ball-handling ability in the full-court, Ahmad scored most of his points on coast to coast drives in the second half, skillfully dribbling through Christian Brothers defenders. After the game, Ahmad mentioned West Virginia as the school recruiting him the hardest, but also that he is seriously considering Maryland, Rutgers, Miami (FL) and several others. Jalen Hudson – ’14 Akron SVSM SG: It wasn’t just King that stood out for Akron St. Vincent-St. Mary’s in their win on Saturday, in fact in the first quarter King hardly contributed. That’s because Virginia Tech commit Jalen Hudson was on fire. The hot-shooting senior wing knocked down several key shots early for SVSM, finishing with 13 points in the first quarter alone on his way to a 23 point outing. In addition to knocking down some jumpers, Hudson also showed great potential off the dribble in transition as a nimble scorer, and even some in the half-court, including a vicious dunk over a 6’8 defender. AJ Harris – ’15 Dayton Dunbar PG: The Ohio State commit had a tough matchup on his hands as he was paired against Kentucky signee Tyler Ulis and Chicago Marian Catholic, however, like he always is, Harris was up for the challenge. Harris scored 25 points in the game, and even though Ulis had 30 points and Marian Catholic won the game, the 5’10 junior floor general still proved that he can play with anyone in the country. A speedy guard that can shift directions on a dime and is efficient as a scorer with a floater in the paint or with the assist, Harris is best in the up-tempo game, and always seems to play his best in big games. After his matchup with Ulis, we’re still convinced that he’s Ohio’s premiere point guard in 2015. Xeyrius Williams – ’15 Huber Heights Wayne PF: Leading Wayne to a 1-1 record over the weekend, Williams (along with fellow junior prospects D’Mitrik Trice and Ahmad Wagner) impressed in both games. One of the more versatile players in the class, Williams has continued to show improvement over the years, and his skill-set has really developed nicely. Williams plays the role of pure wing and face-up four for Wayne, and is probably best at operating out of the mid-post or short corner where he is a true triple-threat to hurt the defense. Williams was especially efficient on Sunday, as he tallied 20 points in a Wayne win over Houston HCYA. After the game, the junior mentioned offers from Ohio University, Kent State, Miami (OH), Toledo and Robert Morris, as well as interest from Lehigh, Butler and most recently Stanford. Javon Bess – ’14 Gahanna Lincoln SF: The Michigan State signee did his thing against the host team, Kettering Fairmont, on Sunday morning, tearing up his opponent for 30 points in a double-double performance. Bess’ athleticism was simply too much for Fairmont, as he consistently drove by defenders and scored at the rim. One area that Bess has spent a lot of time developing is his perimeter jumper, and the senior wing showed good efficiency in that department, converting on more than he missed. Chelvonte Montgomery – ’14 Cleveland Garfield Heights SG: One of Ohio’s toughest seniors, and top available prospects, Montgomery is having himself a huge senior season in his first and only year at G-Heights. Matched up against the powerhouse Dallas Prime Prep, and their star Emmanuel Mudiay (SMU signee, ranked top five nationally), Montgomery showed no fear as he led Garfield Heights with 24 points in a loss, which was closer than many expected through three quarters. Montgomery is an aggressive slasher who can score in the mid-range but likes to barrel over people and find gaps to get to the rim. Currently with offers at the Division I & II levels, expect Montgomery’s name to be mentioned often around recruiting circles in the coming months. Doug Taylor – ’15 Columbus Northland C: While he is one of the least hyped players on a talented Northland squad, Taylor continues to get it done in his junior season. This time, the 6’8 center was pivotal for Northland as they earned a huge win over nationally ranked Roselle Catholic (NJ). Along with senior power forward Jaylen Tucker, Taylor was all over the boards inside for Northland, and also contributed 14 points and a few blocked shots. He’s still developing, but we believe Taylor is one of the top sleeper big men in all of Ohio in a very good 2015 interior class.